All woodwind and brass players will need these while we learn the show and to use in certain performances, including the pep band music in the stands at football games. This page is intended to help you get the correct equipment. You can purchase these at local music stores, but we recommend you call ahead to see if they have what you need in stock and possibly take your instrument to confirm it is the correct item. You can also order them online from vendors such as Musician's Friend, Woodwind & Brasswind, Cascio Music and Amazon. Generic flip folder - Clarinet, saxophone, sousaphone and other brass if you go with a standard lyre in place of a clip on flip folder. Clarinet and saxophones will need an instrument-specific lyre to use these. Flute lyre/flip folder - All-in-one combination that goes on the player's arm. Clarinet lyre - goes around the ring between the two body pieces. It can be challenging to get the ring on, but directors or veteran members can help. Best to leave ring on by just unscrewing the top portion when putting your clarinet away. Have had some people snap the top part off by accident the last few years, so be aware of that. 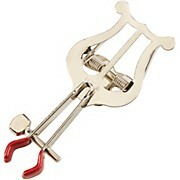 Brass clip on lyre/flip folder - All-in-one combination that clips on to the edge of the instrument bell. The model intended for the trumpet has the clips on the bottom...this one really only works for trumpet. The model intended for trombones has the clips on the side and can work with trombone, mellophone, baritone and even for the trumpet if needed. Saxophone lyre - should have two 90 degree bends. Instrument should have receiver for the lyre on the front just below where the neck goes in with a screw to hold it tight. The downside of these are that you can't access the reverse side of the windows when it is clipped on, so you usually need more windows for the music. Trumpet lead pipe lyre - these solve the issue of the 3rd valve kicker, but can sometimes be a challenge to tighten enough that they don't move around while marching or doing visual work.